Congress would just like to take a moment to blur that useless "church and state" line, if that's cool with everyone. 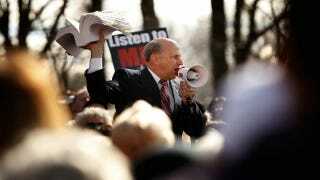 On April 7, Rep. Louie Gohmert (R-TX) introduced H. Res. 211, a resolution "expressing support for designation of the first weekend of May as Ten Commandments Weekend (expertly times to coincide with the National Day of Prayer) to recognize the significant contributions the Ten Commandments have made in shaping the principles, institutions, and national character of the United States." Congress actually has a fairly rich history of this. Rep. Paul Broun (R-GA) introduced a very similar resolution last year with H. Res. 1175, and proposals for a "Ten Commandments Weekend" have also been introduced by Sam Brownback and Joe Lieberman in the Senate, and Rep. Todd Akin (R-MO) in the House. But there is one fairly troubling difference this year. Last year, the Democrats controlled the House Committee on Oversight and Government Reform, which was able to successfully keep such resolutions from ever making it to the floor. However, now that the Republicans are in control (with eight members of Rep. Randy Forbes's (R-VA) Congressional Prayer Caucus, including Gohmert himself, on the committee) it seems far more likely that this resolution could very well make it to the floor for a vote and maybe even father still. I'm excited for the day when members of Congress finally come out and clearly state that we are "One nation under God, A Christian God, Period. Amen." instead of slowly creeping over to the microphone every few months to whisper it in our ears. (3) encourages citizens of all faiths and religious persuasions to reflect on the important impact that the Ten Commandments have had on the people and national character of the United States.